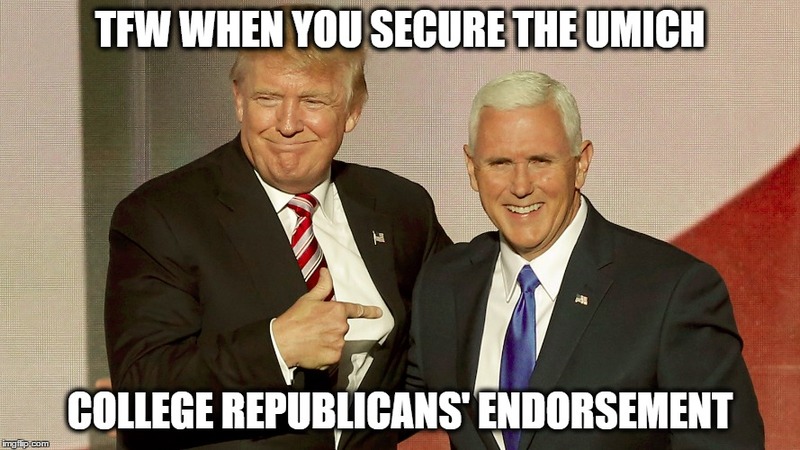 College Republicans at the University of Michigan made a formal endorsement of Donald Trump and Mike Pence for President and Vice President on Wednesday, September 14, saying in their official statement that “the College Republicans at the University of Michigan will officially be endorsing the Trump-Pence campaign for this election.” This news comes in the wake of many College Republican chapters’ at various esteemed universities, including, Princeton, Penn State, and Harvard, opting not to endorse the GOP presidential nominee—and even going so far as to endorse Libertarian presidential candidate, Gary Johnson, as was done at Cornell University. Zalamea believes that Trump should receive the full support of the GOP despite the “mudslinging” in the primaries. Acknowledging that much of the rhetoric coming from the campaign early on may have been “jarring for some people,” Zalamea insisted that “any Republican is better than Hillary Clinton” and that “any vote not for Trump is a vote for Clinton.” When asked about many Republicans’ reluctance to support Trump due to his “in-your-face” rhetoric and bombastic style, Zalamea wanted to remind voters that “it’s not just one individual coming into office; it’s an entire administration.” Zalamea believes that Trump should receive the full support of the GOP despite the “mudslinging” in the primaries. However, in the event of a Republican loss in November, he said the blame would be “distributed among all of us [Republicans],” not just the “Never Trump” crowd. In both the organization’s official endorsement and in his interview with the Michigan Review, Zalamea encouraged voters to vote “down-ballot Republican for both your state and congressional candidates” regardless of their support of the GOP presidential nominee. Take a look at what happened when the Cornell Republicans endorsed Gary Johnson. They lost their funding and were expelled from the New York Federation of College Republicans. It shouldn’t be surprising to see a student political organization follow whomever its party designates as its political leader. Hillary is not perfect, but at least she is sane with a sound grasp of how to be the leader of the free world. Trump will not listen to advisors because he thinks he has a “good brain” and that he “knows more than the generals.” I’d rather not be an ideologue and feel forced to vote a dictator into office.